TriStar Electric will expertly repair those Home Inspection Electrical Failures. Put you home on the market ASAP! Selling your home can be extremely stress-inducing. First and foremost, it must pass inspection in order to be placed on the housing market. There is a slew of common, easy electrical repairs which cause most homeowners to fail inspections. Bad electrical wiring is probably the most common. Luckily, calling the right team of professionals will help get these out of the way quickly and efficiently. Put the stress of home inspection repairs into the hands of trusted electricians who troubleshoot problems, and expertly solve them for you and your family. Faulty Wiring– If your wiring is damaged, worn out, or improperly installed your home inspector will likely notice. Older homes, built before the 1970’s, often have aluminum wiring that needs to be replaced. Exposed, frayed wires or sloppy endpoints and connections will definitely fail inspection as they pose a danger to those living in the home. Damaged Electrical Paneling– The electrical box in your home should be free of visible damage and easily accessible. 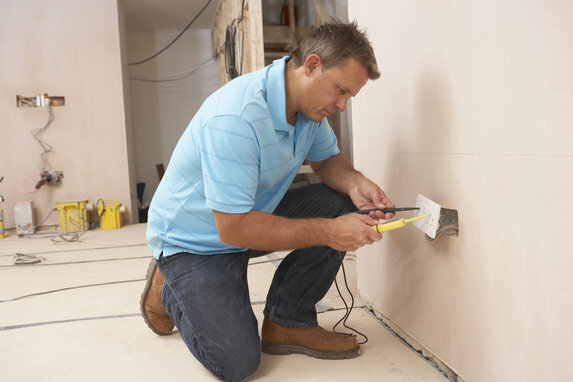 Your home inspector will check the wiring to make sure everything is in working order. There, again, should be no frayed ends, exposed metal coiling etc. He/she will also make sure that all switches are functional. Inadequate Powering-Older homes often have inadequate power issues. With lack of amperage to meet modern needs, these homes often need the most electrical repairs in order to pass inspection. Nowadays, we use a lot more electronics (WiFi, television, video games etc.) in order to power our homes, so the shift from simpler times needs to be made in order to ensure your home’s adequate electrical capabilities. Bad Electrical Outlets– Your outlets should not be overheating, or sparking, and should never feel loose. If a lot of them do not work or have any of these issues, your home will likely not pass inspection. Sometimes homes have too few electrical outlets and you’ll need to add some in order to pass. Without enough outlets, your electrical system may overload, and the risk of fire is more likely. Improper Grounding– Your home needs a certain amount of grounded receptacles and wirings in order to function in this day and age. A licensed electrician will make sure the underbelly of your home meets code. GFCI outlets missing or faulty– Ground fault circuit interpreters are used to protect people from electric shock. Often times, these lovely devices are installed in homes near bodies of water. If your home is near a body of water and does not have one, it will likely not pass inspection. They must be installed in all necessary areas following safety procedures. TriStar Electric Will Answer Your Questions and Make the Necessary Repairs! If you have any questions about a Residential Electrical Maintenance, please contact TriStar Electric, Maryland’s premier residential and commercial electrician, by calling 410-799-5791 or 301-384-8880 or fill out the contact form on our website. Our electricians can provide you with a competitive quote that covers every stage of the process – from installation to final testing. This entry was posted on Wednesday, May 25th, 2016 at 1:25 pm. Both comments and pings are currently closed.